Primero Health is proud to be associated with these great organizations! 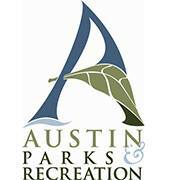 Primero Health partners with Austin PARD in various events throughout the year. We have held Zumba classes and have sponsored community health screenings at various rec center locations. We have also participated in back-to-school events to help distribute health information and school supplies to families. 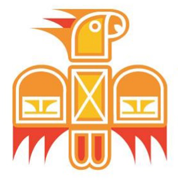 The Center is a resource for the community and visitors to learn and participate in classes and programs that will foster a meaningful understanding and appreciation of not only Mexican American, but also Native American, Chicano, and other Latino cultures. Latinas Unidas Por El Arte, or LUPE Arte, is a multimedia nonprofit arts education organization encouraging Latino arts and culture within the Austin, Tx community. Inspired by a lack of arts education in Texas, we decided not to focus on just one discipline but to work with film, theater, visual arts, and many other areas of the arts. We run a variety of different programs that provide after-school art classes and give young people access to artists working in areas ranging from writing to filmmaking to visual art. Our goal is to be as culturally diverse as possible. We cultivate a healthy community by strengthening the local food system and improving access to nutritious, affordable food. SFC envisions a food secure community where all children and adults grow, share and prepare healthy, local food. We are honored to be recognized by our partners! GAHCC CAPITAL OF TEXAS AWARDS! Greater Austin Hispanic Chamber of Commerce (GAHCC) nominated Primero Health for a Capital of Texas Award. Each year, GAHCC recognizes high-achieving small businesses and organizations in the Greater Austin area. All winners are selected by the general public. Voting ended on Friday, April 18. 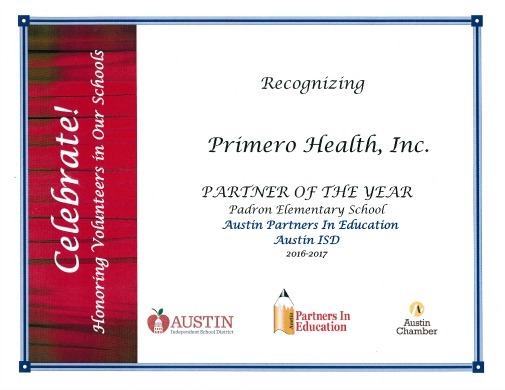 Primero Health is being recognized as a partner in education. 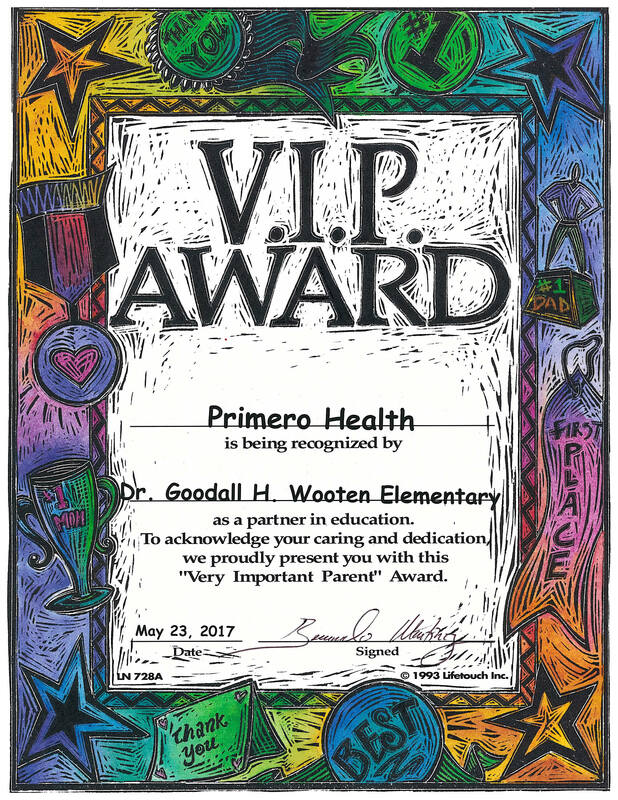 To acknowledge your caring and dedication, we proudly present you with this “Very Important Parent” award. Primero Health is being recognized as Partner of the Year. Honoring volunteers in our schools.